“How can art and story heal the disconnect between modern humans and the environment?” That was the title of my talk for the “Frontiers in the Environment: Big Questions” lecture series at the University of Minnesota (Institute on the Environment). Here, I presented my approach to art-led environmental education called “Earth Systems Journey” and shared a high school pilot project called “River Journey: Exploring the Value of the Mississippi River.” The following case study describes the year-long water project and how it dealt with this big question about healing the disconnect by revealing place-based interconnections between a school and its river. The premise of our interdependence with natural systems is foundational to the concept of sustainability (Edwards 29), yet this concept can seem abstract or inconsistent with our predominantly fragmented institutions that shape our view of the world (Palmer 96-102). If we don’t internalize the experience of our interdependence, can we truly act in a sustainable way? Several thinkers support the idea that paradigm or the story out of which we act is a primary driver of change. In the Worldwatch Institute’s, State of the World 2010, Jonah Sachs and Susan Finkelpearl leverage lessons from the marketing world for environmentalists: “…facts alone do not sell behavior change. Instead, people working to foster sustainable behavior must use storytelling to reach audiences on a human, personal scale” (152). Donella Meadows, the systems analyst, thinker, teacher and writer goes so far as to say “Paradigms are the sources of systems,” in outlining the factors influencing systemic change (163). In “The Sacred Balance, Rediscovering Our Place in Nature,” environmental writer and educator, David Suzuki issues this call to action: “… we must find a new story, a narrative that includes us in the continuum of Earth’s time and space, reminding us of the destiny we share with all the planet’s life, restoring purpose and meaning to human existence” (25). Earth Systems Journey draws from the insights of systems thinking and the power of story, particularly the form of the Hero’s Journey described by Joseph Campbell. The three main design strategies of Earth Systems Journey are: Engaging with Infrastructure – to reveal and appreciate our interconnections, Specificity to Place – to make learning embodied and personally relevant (Sobel), and use of Narrative-Aesthetic Experience – inspired by traditions of ritual and pilgrimage. These strategies will be evident in this case study, but more background on their basis and development can be found in the previous publication about the development of Earth Systems Journey (Brigham “Downstream/Upstream”). The video of my Institute on the Environment lecture also provides a summarized overview of the theory and formal aspects of Earth Systems Journey (Institute). …I suddenly thought, “We are the air, we are the water, we are the earth, we are the sun.” With this realization, I also saw that environmentalists like me had been framing the issue improperly. There is no environment “out there” that is separate from us (7). Fostering this perception of the self as unified with place is the main goal of Earth Systems Journey, where it is referred to as experiential integration. Achieving a state of experiential integration internalizes a story or paradigm of oneself as materially integrated with one’s surroundings, first locally, then expanded regionally and globally. While the idea of ‘sense of place’ has many associations, in the context of this study, it is understood as this integrated sense of self/place unity. River Journey is the third pilot of the Earth Systems Journey model. The first pilot, called “Downstream/Upstream,” conducted in a preschool/kindergarten, was implemented in conjunction with the development of the model in 2011. A second, small, informal pilot, “April Showers, Storms, and Flowers,” was conducted with a second grade elementary class in 2013. The general research question throughout these projects and new pilots underway is “How can Earth Systems Journey, designed to foster a sense of experiential integration, be developed to better achieve this goal?” This involves issues ranging from exploring the nature of experiential integration, to addressing logistics that ease the process. The River Journey pilot offered an opportunity to explore new questions specific to the place, program, and interests of the project team including: how does the model differ in its application to a high school age setting, how does the model perform when it takes place over the course of a year (versus prior shorter time frames), how can the model make use of and enhance pre-existing structures and practices for building community and making meaning in the school, and finally, with the integration of GIS story map technology into this pilot, how can the model adapt its use of maps and story to take advantage of this technology that integrates the two (ESRI). The bulk of the analytical research will take place over time, and very likely through comparisons of multiple pilot projects. 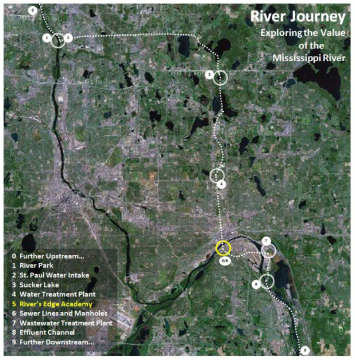 While some preliminary interpretation of River Journey is included here, this case study is primarily descriptive – explaining what happened, and the rationale behind the approach. River Journey data that will inform the developing analysis include pre and post student questionnaires, teacher, staff, and partner organization questionnaires, observation of student interaction, and examination of student artistic and written work. In the following sections, I describe the background and implementation of the River Journey project. The project formation and implementation is a reflection of the overall structure of the Earth Systems Journey Model, but the model is also designed to be adapted to place: the local ecological and infrastructure systems, the academic program and age level, the educational culture, and the interests of the team leaders and participants. Thus, throughout, I also describe some of the ways the project’s form reflects this adaptation to place. Project Inception: The project started with my search for a site at which to conduct the next pilot of the Earth Systems Journey model. In October of 2013, I met with the Executive Director of River’s Edge Academy charter high school and we agreed there was a good fit between the goals of the school and the model. We established a project plan for the 2014-2015 school year and assembled the partner team described below, while I sought funding through a resident fellowship from the Institute on the Environment. In February 2014, the fellowship and associated funding were set up. During the resident fellowship I became a visiting scholar in the College of Education and Human Development, in consultation with the head of its art education program. The fellowship funding covered my time and a summer teacher planning stipend, with the rest of the work contributed as in-kind time and materials. The School: River’s Edge Academy is a public charter high school in St. Paul, Minnesota. It serves grades 9-12 and during the year of the project had an enrollment of about 70 students. The school is overseen by Audubon Center of the North Woods Charter School Division, which also sponsors 34 other charter schools in Minnesota, requiring all of them to incorporate environmental education. River’s Edge Academy has a focus on the Mississippi River and environmental education, and follows the expeditionary learning model (River’s Edge Academy). In Minnesota, charter schools must lease space, and this school is housed within an office warehouse in an industrial/institutional neighborhood. The school is about a quarter mile from the Mississippi River, with access at a public park that provides an outdoor learning environment for the students year round. The school and its neighborhood are within the boundary of the Mississippi National River Recreation Area, part of the National Park System (National Park). While most of the land in this park is privately held, there are interpretive resources and activities for the area. Figure 1 shows the location of the school. park by the Mississippi River. As described later, the River Journey project engaged with a variety of the organizing structures of River’s Edge Academy that are designed to foster different types of connections in a small community. For background on the school context, they are described here. The first structure is comprised of grade level groups (named: Tribs, Rapids, Eddies, and Deltas after features of a river). These are where the main academic work takes place. The second structure is “crews,” made up of a small group students from multiple grades that stay with an adviser throughout their years at the school. Crews meet regularly throughout the week, provide social support, and are where much of the field work and community service projects take place (River’s Edge). The third structure is the all-school community-building time during lunch and in a weekly circle gathering. This is a time for reinforcing school values, and for staff and students to express appreciation to each other. Many-faceted Team: The Earth Systems Journey model involves a wide array of team members from the school and the wider community. The relationships between team members and the exposure of students to them is part of the value the model seeks to offer. I led the project in coordination with the director and in collaboration with teachers, teaching aides, administrative staff, and students. The teachers and aides helped plan the project and created learning modules in response to the overall project themes. There were many partners on the team from the University and wider community that provided in-kind time. U-Spatial is the University of Minnesota’s spatial thinking and GIS resource group that provided GIS training, advice, and prepared some of the materials. The National Park Service provided a park ranger to be a guide, guest speaker, and to help create materials for the project. Representatives from the watersheds the students explored in their journey helped interpret the landscape’s relationship to the river. Staff from the water treatment and waste water treatment facilities served as tour guides for their facilities and a representative from the City of St. Paul helped plan and provided support materials for exploring the city’s infrastructure connections. The design and materials for the interactive art elements were donated by Full Spring Studio, the company through which I practice studio and public art. The full team list can be found on the project website (Brigham, “Team & Support”). Project Timeline: The River Journey Implementation took place during the 2014-2015 school year, preceded by a planning phase and followed by project dissemination and outreach. In this section, I describe the implementation of the River Journey project organized by the timeline of the phases described above. During the summer of 2014 I met with the director and a planning team of teachers and teaching aides that would help implement the project. After I introduced the project model, previous pilot, and the idea of using GIS story maps, we worked on adapting the general structure of the Earth Systems Journey model to place, program, and interest areas. I had presented the commonly referenced sustainability triad (Edwards 20-23) which I expressed as interdependent value systems of Ecology, Economy, and Community. The teachers were particularly interested in the idea of having students explore the Mississippi River through these three values. Since the project was to be applied across disciplines, this gave the flexibility to address different ways of seeing the river. The teachers chose the title for the project, “River Journey: Exploring the Value of the Mississippi River,” which defined the overarching research question for their students: “What is the value of the Mississippi River?” It was determined that the activities in fall would best fit in the times designated for students to do fieldwork with their crews. To accommodate staffing and transportation, almost all fieldwork happened twice, in two groups—sometimes in back to back days, and sometimes spread as much as a month apart. I discussed the need for an iconic starting point of familiarity, called the “flow node” in Earth Systems Journey. The team chose the kitchen sink, since the students use it frequently in meal preparation and clean up. Thus, it was a point of water use that represented an aspect of school community. In response to the planning, I drafted a guiding poem for the project, called “River Journey,” which the team approved and is shown in Figure 2 (Brigham, “River Journey Poem”). Working with the school administration, I coordinated tours with community partners. We set the locations and timeline for the parts of the journey with the launch activities taking place the first week of school. Note on Place Adaptation: As described, and by design, place adaptation was reflected in school leader initiation and ownership of project title, themes, “flow node” (sink), adoption and pace of GIS, and where the project fit into academic structure. While the entire project is called “River Journey,” this phase is the “journey” heart of the project where students trace the flow of water upstream and downstream from their school, through infrastructure, to the Mississippi River where it is sourced and to which it returns. Figure 3 shows a map of the journey. Here are excerpts from the story map created about this experience that summarize the main activities in each part of the journey, (Brigham and River’s Edge Academy). 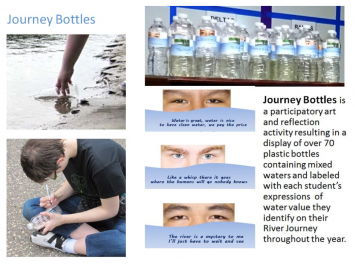 Figure 4 shows images from the Journey Bottles activity that is described. Upstream: The project began at River’s Edge Academy on August 27th, 2014, with a circle gathering and an opening poem, called, River Journey, recited by teachers and the project coordinator that launched the project. This was followed by workshops led by teachers to introduce students to the value system themes of the project: economy, ecology and community. Then students received their “journey bottles” that they carry throughout their travels and use to collect water at each location and record the water values they perceive along the way. The next two days were spent on an upstream tour, visiting River Park, St. Paul Water Intake, Sucker Lake, and the St. Paul Regional Water Services water treatment plant. Midstream: On September 15th and 16th, students split into two groups. 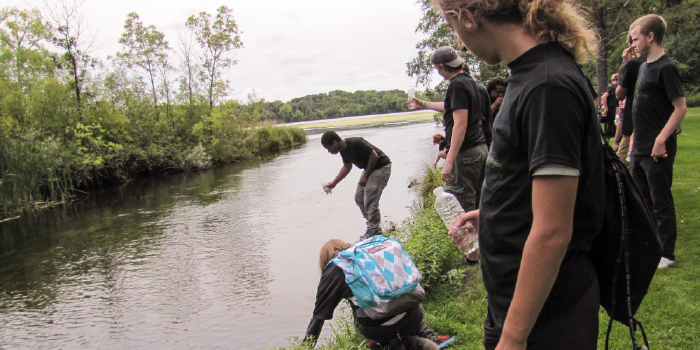 On one day half the students explored water use at River’s Edge and the beginning of its downstream path along the sanitary sewer to a local lift station. On the other day, students went on a canoe trip with Outward Bound and passed by the same places they had seen at River Park and St. Paul Water Intake, but this time from the point of view of being on the river. They arrived near River’s Edge at Harriet Island, midstream of their River Journey. Downstream: On September 24th, All the students went on a riverboat ride, guided by Brian Goodspeed, Park Ranger with the National Park Service. The boat ride started from Harriet Island, near their school, downstream to where the water flowing through their school will return to the river, near Kaposia Landing in St. Paul. On October 6th and 7th, Students visited the Metropolitan Environmental Services Waste Water Treatment Plant, then visited Kaposia Landing, across the river from where the waste water treatment plant returns the water back to the river. At this point, they added their own verses to the River Journey poem to conclude this phase of the River Journey project. Note on Place Adaption: Since the school is walking distance to the Mississippi River, the river could be visited and referenced throughout the project, not just at the far ends of upstream and downstream field trips. Also, other factors led to the students traveling the river upstream and downstream from their school twice. A canoe trip, which was not part of River Journey proper, had already been planned from upstream (upriver from the water intake) to the landing by their school. This allowed the students to have a dual experience of the upstream connection between the Mississippi River and their school: one from a canoe on the water, and one by bus, along the infrastructure that connects the intake to their water meter and sink. Downstream, the River Journey tour of the infrastructure leading from their school to the waste water treatment plant led them to the point where the treated waste water returns to the river. 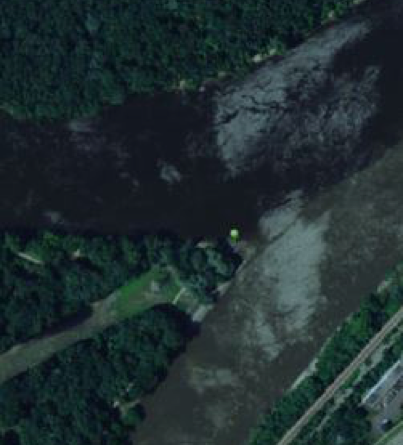 In prior projects, I had conducted a riverboat ride to that point of outflow to get right up to the point of confluence. Even though they had reached this point by land, the school was very interested in also traveling to it by riverboat, so a trip was chartered. Thus, the students also had a dual experience of the downstream connection between their school and the Mississippi River, one along the connecting water infrastructure, and one by riverboat leading to the place where their wastewater rejoins the river. In prior projects with younger students, these dual paths might have confused the clarity of the story of their place in relationship to the river. But for this high school audience, the multiplicity of ways the story of water flows through or near their school was suitable for more complex and open ended reflection. Phase 2: Reflection/Story Map: The integration of GIS training and the development of the first story maps of the project took place in fall and winter 2014. Teachers were introduced to the principles and software in the fall, and two groups of students traveled to the University of Minnesota to explore the map library and learn to make GIS story maps from instructors in the U Spatial group. Each student chose a photograph (one provided or their own) from a location on the journey and a theme (ecology, economy, or community) and wrote a travel journal entry. These were assembled into a joint document that students could use to practice creating GIS story maps. I assembled the final story map from this process, sending questions and comments back to the students to clarify their entries for the final product. Mid-year Celebration of Learning: River’s Edge Academy holds a mid-year gathering in January where students prepare presentations and displays of work they’ve done during the school year and present these to parents and community members. A team of students presented the River Journey project as of that time, including the GIS story map representing work from all students. Note on Place Adaptation: Building this stage of project storytelling into existing school structures for reflecting and celebrating helped the project blend naturally into the culture and rhythms of the school and added to the body of knowledge and experiences shared. Figure 7 shows a student presenting the story map to a new teacher during the Celebration of Learning. 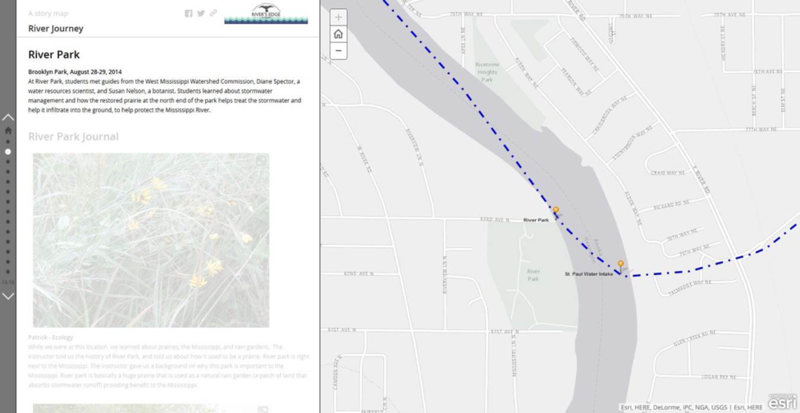 Phase 3: Interpretive River Story Maps: More than any other phase, this one is substantially adapted to place in term of teachers’ goals for project integration. The Earth Systems Journey model culminates in a service project. The fall storymap that educates the public about water issues could have fulfilled the role of a service project in itself. The team had ideas about planting a rain garden to extend the service project, but there was not enough time to plan this for spring. Instead, the team took on another educational story map project to expand the river exploration and service activities. This effort was more ambitious and more broad in scope than the first: an expansion of the idea of River Journey integrated throughout the curriculum, resulting in another suite of story maps. The team reconvened to plan this next phase. The fall fieldwork and storymap development had taken place mostly during the program time devoted to crews, and were part of the crew time grading. 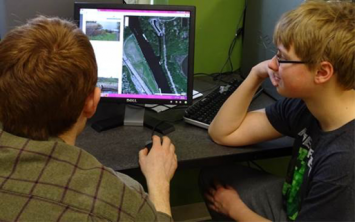 The teachers thought the students could go deeper and the theme be better integrated into coursework if, for spring, the river themes and GIS work were integrated directly into the core classes, which represent the bulk of student time investment and grades. The story map integration concept was developed over time. A representative from U-Spatial and I met with each teacher to help bridge their assignment concept to what would be feasible with GIS and available spatial data. 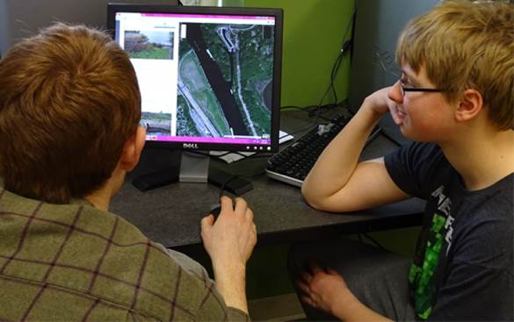 To allow students more hands on GIS time we devised an approach where each student would make their own GIS storymap reflecting their assignment, and these would all be linked from an introductory story map to the topic and assignment for each class. In turn these class story maps and the fall story map would be linked from a master River Journey story map that would serve as an introduction to the entire project. 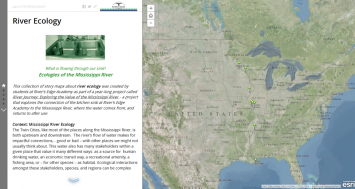 The resulting story maps would be available online to share student learning and engage the public in seeing the Mississippi River in a myriad of perspectives. To build the story maps, I conducted map-lab sessions with each of the classes to guide them through the GIS portions of the assignments, allowing the teachers’ emphasis to remain on the assignment content and student support. I worked with each teacher to create the class story map with links to the student story maps. Each of the core content teachers (English Language Arts, Science, Math, and Humanities) chose a grade level and an assignment concept to develop, integrated with educational standards they were teaching during spring. In math (statistics unit) students analyzed local, metro area population projections for each county and speculated on what this means for future water demand; in science (ecology unit) students explored a variety of ecological issues represented by news articles along the length of the Mississippi River; in English Language Arts (interview and transcription unit) students interviewed people from the community about their relationship to the Mississippi River; and in American Studies (Civil War unit) students examined historical maps from the Civil War and considered the representation and role of water. Note on Place Adaptation: This phase of the project was particularly driven by interests and needs unique to the school. To enhance a sense of connection of these broad river explorations to place, specifically the school itself, I articulated the explorations as part of the answer to the question from the guiding poem: “What is flowing through our sink?” See figure 8. These many stories of water do not literally or materially flow through the sink. However, as part of a unified understanding of the water cycle they could be understood, metaphorically, be flowing through it. Thus, the sink serves as a touch point to place – to the Dakota story of B’dote, to the ecological plight of the mussel, to the tension within population and water resource calculations, and to the historical (and current) strategic importance of water to security and power. Year-end Celebration of Learning & Graduation: To conclude their year, River’s Edge Academy holds a final circle gathering and a second celebration of learning presented by students to parents and community in conjunction with their graduation ceremony. In the final circle gathering, the River Journey theme returned as part of the closing ceremony, with interested students and staff going to the center of the circle and pouring water gathered from the kitchen sink into a vessel and expressing what they valued about the Mississippi River. The Celebration of Learning and graduation were held on the Minnesota Centennial Showboat, a riverboat theatre near the school. Here, four teams of students presented story maps from the four course integration assignments. A photo montage of River Journey was included in the slide show about the year. This activity concluded the primary River Journey project, though by design there would be subsequent activities for project dissemination and outreach. Note on Place Adaptation: Integrating the closing activities of River Journey into the closing activities of the school helped integrate the River Journey into the culture and practices of the school. Project Dissemination and Outreach: Project dissemination began before the project was complete, with a public lecture in February 2015 about the Earth Systems Journey model, including the activities to date on River Journey. Shortly after the project conclusion in June I opened an exhibit at a University of Minnesota campus art and meeting space titled: “We Watch the Stream: Impressions of River Journey,” which included project documentation and artwork representing my impressions of student work and experiences (Brigham, “Exhibit”). The exhibit’s purpose was two-fold. First, to document the project and the student’s experience for an expanded audience. And second, through creating this documentation in a newly interpreted way, to create a new primary experience for others, to vicariously recreate the journey for themselves. In addition to the lecture and exhibit, team members received a grant from ESRI, publishers of the GIS software used for the project, to run a summer teaching institute at the school using the project as a case study and method example to inspire others to integrate GIS into their place-based, experiential, environmental education (Brigham, “Workshop Information”). Most recently, the project was presented at the 2015 conference for the Association for Advancement in Sustainability in Higher Education in a session on using GIS story maps for place based campus work, and in a session on art and environment. While research analysis on this case study is still underway, some preliminary observations on the use of GIS to engage with place seem worth sharing. Through this pilot I realized GIS can enhance or even be a primary experience of place itself, not just a way to document or contextualize place experience from the field. Perhaps this goes without saying for those who use GIS in creative ways or for field collection of data. But in this case, since we were not set up to use GIS in the field, and despite an intention to use GIS in creative ways, I had a preconception that GIS would be primarily about adding an analytical layer to the work and producing a polished documentation of student place experience that occurred elsewhere. Ideally, I thought, GIS use would be iterative throughout student projects and fieldwork, and the analytical contribution of GIS in the classroom would enhance experience of place in the field. However, due to time and experience constraints, the GIS use usually occurred at a late stage of the primary fieldwork or coursework it referenced. Where analytical uses were employed, they tended to happen as a final stage of student work. However, even though GIS was not optimally integrated, I believe it enhanced a sense of place in the project in ways I had not anticipated. 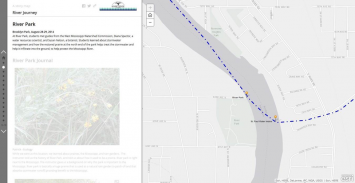 More than an add-on, GIS became part of the narrative-aesthetic experience of River Journey. These GIS contributions offer ideas and opportunities that could be explored in more depth in future projects. The following observations are adapted from a recent presentation summary (Brigham, “Process Reflection: A Call to Mapping”). Marking and Naming: I was interested, particularly for high school age students, in connecting them to their agency and power as map makers. For example, as shown in figure 9, there is great significance in the simple act of placing a map pin at the confluence of the Mississippi and Minnesota Rivers and labeling it “B’dote” after interviewing a Dakota band member about the supreme significance of this place to their creation beliefs. Marking and Naming a place on a map and telling its story is a ritual act of placing significance to a part of the landscape. 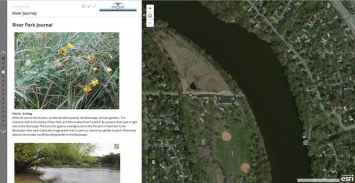 Virtual Aesthetic Understanding of the Land: It is important to the philosophy of River’s Edge Academy and to the Earth Systems Journey approach to go outside and explore real places. Virtual exploration is not a substitute. However, an interactive GIS map offers perspectives that can’t be seen from ground and these are not only knowledge-based in nature – they are also aesthetic. I remember working with a student as they paused from the tutorial on map creation to enjoy the pleasures of flying over and following the river in the satellite image. These are beautiful views that are a primary aesthetic experience in themselves where one can wonder about the varying colors of the water and the textures of the vegetation. One need not be physically on the ground to experience a profound sense of place, as evidenced by the first photograph of the earth from space, arguably one of the most potent images defining our current sense of place on earth. As an Earth Systems Journey, River Journey is inspired by Joseph Campbell’s concept of the Hero’s Journey. This begins with a call to adventure, and is a quest for something. In fairy tales, the hero might seek a treasure and bring it home in a vessel. Knowing their final expression of their journey was to be an online set of story maps made the GIS Story Maps into a key dramatic prop in the journey. The maps were the vessel into which students would place their treasure to bring back and share with community: the story of their exploration of the value of the Mississippi River. A missed opportunity: GIS Story Maps as a Stage Set: While knowing they would deliver their story/treasure in the form of a GIS Story map still held some value, I missed an opportunity to make this more tangible at the beginning of the project and to use it as a physical stage set for the launch and ongoing reminder of the journey. In a prior project, before incorporating GIS in the model, I had constructed a giant interactive wall map that was the vessel for the children’s stories to come, but which also had a presence throughout the project (Brigham, “Map as Stage Set”). The map was prominent in the school and was a gathering place and reference point before each excursion. If the GIS story map had a physical presence, such as a large print out, or a repeated projection on the wall, it could have helped reinforce the sense of place that was building, and remind students of where they’d been so far. In future projects using GIS, I will explore ways to make its presence more tangible throughout the project, to better support the dramatic experience of the journey. Earth Systems Journey is driven by the idea that we need to shift our perception of our place in the world to a clearer sense of interdependence as a foundation for sustainable behavior. But that general idea only comes to life through direct student experience, in which the framework is combined with details that are specific to place and environmental education methods that are appropriate to the school program and age level. Thus, the planning and content considers the unique characteristics of place: its particular ecosystems, human engineered infrastructure, local environmental issues, community and economic patterns, culture of the educational facility and interests of team leaders and individual participants. The activities that accompany the journey may use teaching methods that include traditional environmental education approaches such as developing literacy about earth systems, establishing skills to analyze problems and solutions regarding our use of resources, and fostering a stewardship mindset that motivates us to apply those skills as citizens. Earth Systems Journey need not occur, however, in a traditional environmental education unit. Nearly any discipline could use the approach. It is a matter of finding ways to connect learning unit or program content to the journey to follow an environmental flow (such as water) through the school. In prior projects, science, reading, music, movement, photography, art, and engineering have all been touched on as part of the process. How can we encourage a sense of self and a sense of place that are integrated with each other? How can we foster a sense of experiential integration that embeds our story within a larger story of interdependent natural, social, and economic community? These questions guide the development of the Earth Systems Journey model. The River Journey case study shows one response. Like the students from River’s Edge Academy, we can discover our integrated story, by making a special journey starting from a place we know, such as a kitchen sink, and then following the water, through hidden pipes and treatment plants until we reach its source and destination. When we return to where we started, our view of that place and its flows is transformed by knowing the larger story that runs through it and the places, and people and natural elements that live in relation to it. Earth Systems Journey defines a model structure for engaging with place to discover a sense of experiential integration. Adapting this model to place and program, will introduce new elements and surprises that make each journey uniquely challenging and rewarding. Audubon. “Authorized Schools.” Audubon Charter Schools. Web. 2 Jan. 2016. Brigham, Jonee Kulman. “About.” Earth Systems Journey. Web. 31 Dec. 2015. —. “Downstream/Upstream: A Systems Journey For Experiential Integration in Environmental Education and Placemaking.” Thesis. University of Minnesota, 2012. Print. —. “Exhibit.” River Journey: Exploring the Value of the Mississippi:. Web. 31 Dec. 2015. —. “Map as Stage Set: The Role of Maps in Downstream/Upstream, Part 1.” Full Spring Flow. Web. 31 Dec. 2015. —. “Process Reflection: A Call to Mapping.” River Journey: Exploring the Value of the Mississippi River. Web. 31 Dec. 2015. —. 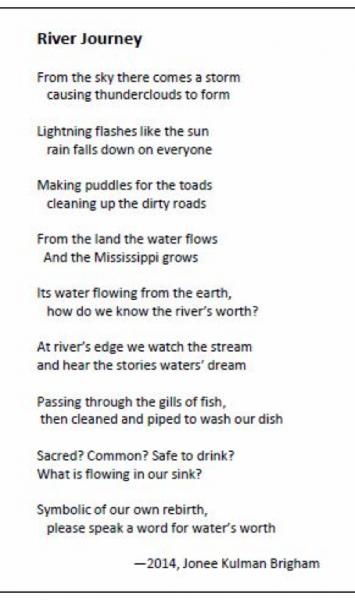 “River Journey Poem.” River Journey: Exploring the Value of the Mississippi River. 3 June 2015. Web. 2 Jan. 2016. —. 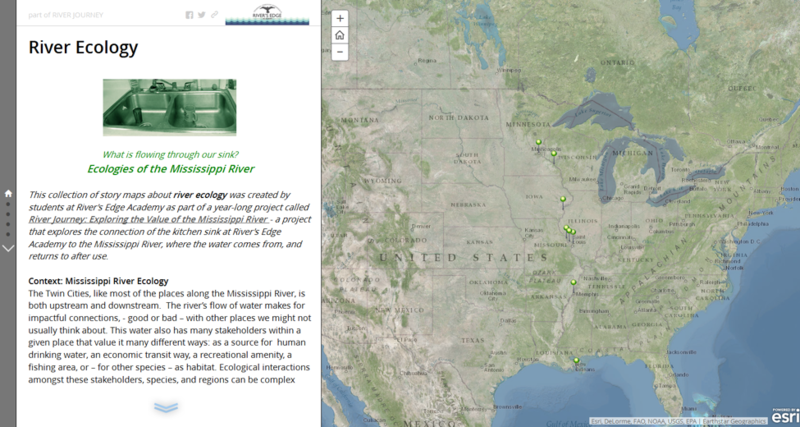 “Student Story Maps.” River Journey: Exploring the Value of the Mississippi:. Web. 31 Dec. 2015. —. “Team & Support.” River Journey: Exploring the Value of the Mississippi:. Web. 31 Dec. 2015. —. “Workshop Information.” Mapping the Journey with GIS. Web. 31 Dec. 2015. Brigham, Jonee Kulman, and River’s Edge Academy. “River Journey – Following the Flow.” Web. 31 Dec. 2015. Campbell, Joseph. The Hero with a Thousand Faces. Novato, Calif.: New World Library, 2008. Print. Edwards, Andres R. The Sustainability Revolution: Portrait of a Paradigm Shift. Gabriola, BC: New Society Publishers, 2005. Print. ESRI. “Story Maps.” ESRI. Web. 2 Jan. 2016. Institute on the Environment, University of Minnesota. How Can Art and Story Heal the Disconnect between Modern Humans and the Environment? 2015. Film. Journal of Sustainability Education. “Call for Papers – 2016 Winter Theme: Place, Learning, And Resilience.” Journal of Sustainability Education. Web. 31 Dec. 2015. Meadows, Donella H. Thinking in Systems: A Primer. Ed. Diana Wright. White River Junction, Vt.: Chelsea Green Pub., 2008. Print. Meg Cavalier. Communications about River’s Edge Academy. 2015 2013. National Park Service. “Mississippi National River & Recreation Area.” U.S. National Park Service. Web. 31 Dec. 2015. Palmer, Joy. Environmental Education in the 21st Century Theory, Practice, Progress and Promise. London; New York: Routledge, 1998. Print. River’s Edge Academy. 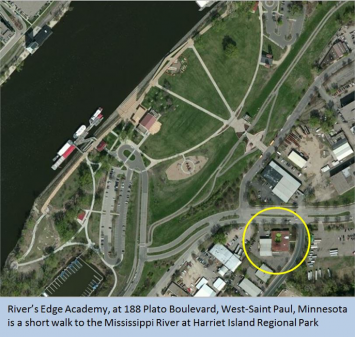 “Expeditionary Learning — St. Paul Public Charter High School.” River’s Edge Academy. Web. 31 Dec. 2015. Sachs, Jonah, and Susan Finkelpearl. “From Selling Soap to Selling Sustainability: Social Marketing.” State of the World, 2010: Transforming Cultures: From Consumerism to Sustainability: A Worldwatch Institute Report on Progress Toward a Sustainable Society. Ed. Erik Assadourian, Linda Starke, and Lisa Mastny. New York, NY: W.W. Norton, 2010. 151–156. Print. Sobel, David. Place-Based Education: Connecting Classrooms & Communities. Great Barrington, MA: Orion Society, 2005. Print. Suzuki, David T, and Amanda McConnell. The Sacred Balance: Rediscovering Our Place in Nature: With a New Introduction. Vancouver: Greystone Books, Mountaineers (Society), 2002. Print.